With 3 hinges and a lock! (Render to follow). And long conversations between a builder, an architect and a very nice lady from South Hams building regulations office in a language that I don't understand at all. The result was a change of plan regarding the insulation and another long trip to B & Q and Palladium. 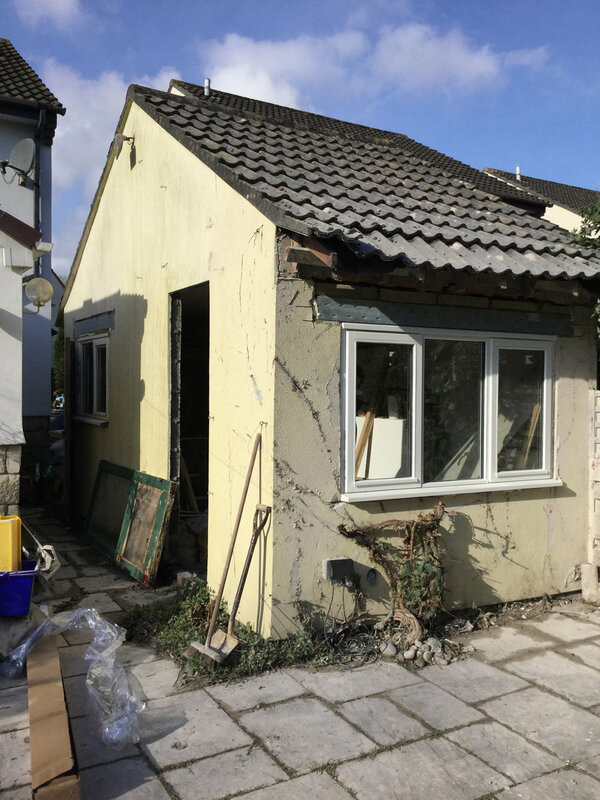 Despite my efforts to design it so that I do not feel like I am working in a goldfish bowl (hence the side window rather than using the ready made hole in the wall left by the garage door ) I will now be working a in a building that has been tanked. Was something lost in translation? The washing line served as a timely reminder of why Rob is not allowed near this build. He put it up for me a week or so ago. I hadn't used it, due to clouds of cement dust. I put a T-shirt on it on Saturday. The line promptly popped off the wall. Never mind, thanks for trying Rob, you are very good at lots of other things! (The builder put it up again - should be safe now). Our enthusiastic builder turned up today, bless him. We are shocked, he's Devonian! We sent him home.